Provide comfort for the family of Belinda Bulaong with a meaningful gesture of sympathy. 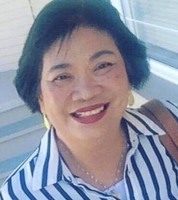 It is with great sadness we announce the passing of Belinda Dar Bulaong on March 17, 2019 at Misericordia Hospital at the age of 64. She was predeceased by her parents Valeriano Sr. and Conversion Bulaong, sister Eleanor Romano. She is survived by her son, Rosauro “Ricky” Alas and grandson, Eric Alas. She is also survived by siblings, Teddy (Myrna), Renato (Evelyn), Napoleon (Cely), Nestor (Rebecca), Aurora, Loida (Roger), Irma, Raul (Maryann), Lilybeth (Alex), Valeriano Jr (Minie), and Arnel (Mabini) and numerous nieces and nephews. Belinda was born on April 27, 1954 in San Josep, Jaen, Nueva Ecija, Philippines. She completed her Bachelor of Sciences in Nutrition at the College of Immaculate Conception in Cabanatuan City. After graduating she moved to Saudi Arabia, UAE before immigrating to Canada in February, 1992. She worked in home care for Winnipeg Regional Health Authority until she fell ill.
She was a devoted Catholic and attended St Mary’s Cathedral Church regularly and volunteered her time at Legion of Mary. Lamay will be held, Friday, March 29, at Mosaic Funeral Chapel - Inkster, 1839 Inkster Blvd from 6pm-Midnight. Funeral Mass will be on Saturday, March 30 at 10am at St. Edward's Roman Catholic Church, 836 Arlington St.
To send flowers in memory of Belinda Dar Bulaong, please visit our Heartfelt Sympathies Store. We encourage you to share your most beloved memories of Belinda here, so that the family and other loved ones can always see it. You can upload cherished photographs, or share your favorite stories, and can even comment on those shared by others. Provide comfort for the family of Belinda Dar Bulaong by sending flowers.